You are here: Home / Lifestyle / Social Media Tips Parents Should Know- Do You Protect Your Personal Information? Social Media Tips Parents Should Know- Do You Protect Your Personal Information? Social media has been around for a relatively short time- under 20 years– and yet it has become a pervasive trend especially among the younger generations. Over 60% of 13–17 year-olds have at least one profile on a social networking site, with many spending more than 2 hours per day on social networking sites. However, social media popularity is not all limited to teens, younger children and parents are very active on social media as well. 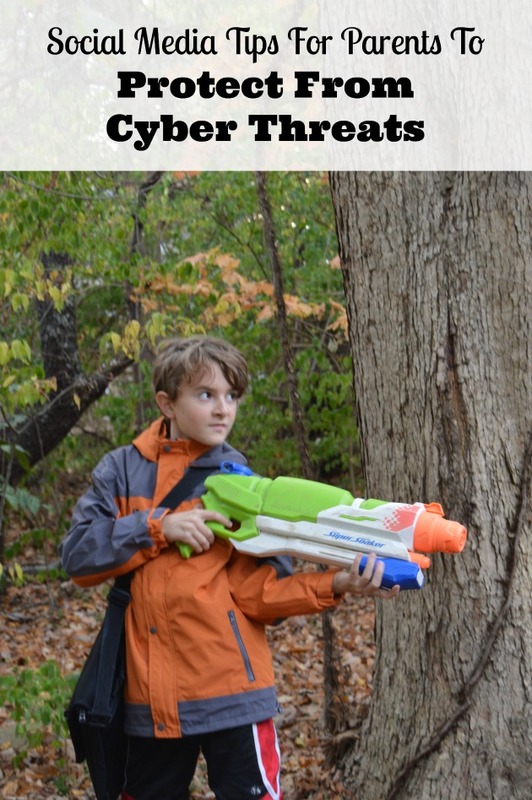 With so much time spent on social media, the obvious question is, “Do you protect your personal information (or that of your children) while on social media?” Many would answer that question with an, “I think so but I’m not really sure.” Today I will share some social media tips parents should know for cyber security and I will also share a nifty tool that provides you with a score that measures your cyber privacy exposure. This post is sponsored by Hueya; all opinions expressed are my own. As a parent, you have to know that you must monitor your own social media use for safety as well as that of your child. You might be thinking, “I’m safe.” But are you really? Many people overshare. Do you protect your personal information on social media sites such as where you are and when you were born? Do you protect that information when posting about your children? Social media is all about sharing but there are some things you should not share. Don’t ever share your private information such as social security number, phone number, or address. Then there are the less obvious thing that you should not share. On vacation? Share when you get back so that people won’t know you have a vacant house. Also, things like your pet’s name, or the state you were born in may seem innocent enough but they are also common password answers that you may not want to tell everyone about. One more of the social media tips parents should know is sites such as Facebook have privacy settings. Are you using them? Is the information you are sharing public or restricted to just “friends” or family? So are you ready for the test? Just how safe are you? You can get a free answer to that question with Hueya. 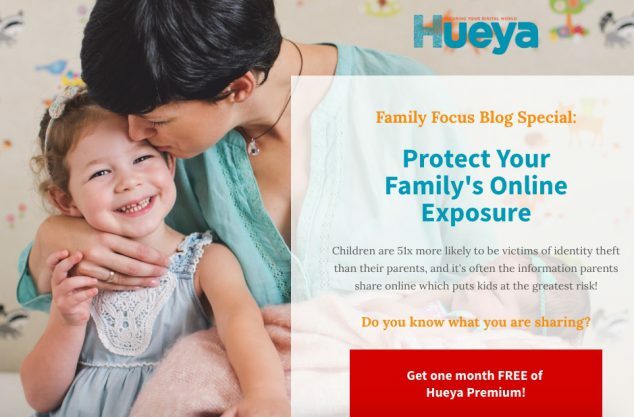 You just sign up and answer a few questions on their website and they will give you a free Facebook scan and tell you what your Hueya Exposure Score is. The scores fall into these categories- DANGEROUS, UNSAFE, AT RISK, SAFE, and LOCKED DOWN. This Privacy Exposure Score represents your online vulnerability to identity theft, fraud, and social cybercrime and helps you determine if there is room for improvement on your social media safety. Why monitor your online world? Because the information you share on social media sites can be used against you. Common threats include identity theft, fraud, and cyber abuse. Hueya was designed to stop these problems from happening. As parents, what we share can put our children at risk. In fact, a study by Carnegie Mellon reported children are 51 times more likely than their parents to have their identity stolen! At Hueya, they are all about protecting people from social cybercrime and helping mitigate cyber threats. 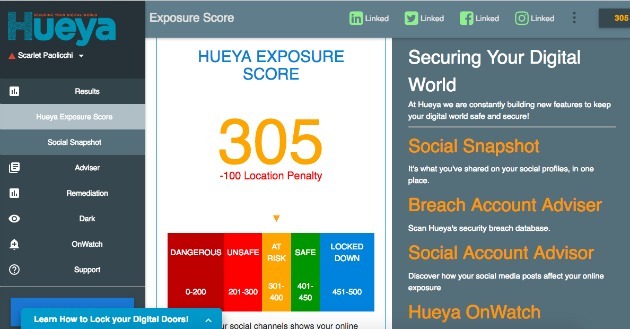 Hueya Cyber Security Software helps you quantify, remediate, monitor your privacy score. This is how Hueya keeps you safe. They offer 4 packages from free to a low monthly rate. 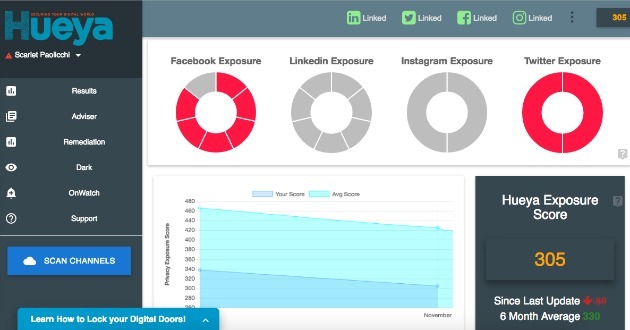 Premium is their most popular package and it includes scans of all your social channels, a Hueya Exposure Score, access to the Dashboard, and access to remediation and alert monitoring services. The Premium option lets you know your digital risk and assists you in fixing any safety issues while continuing to monitor for new problems. I am happy to tell you that Hueya has agreed to give my readers one free month of Hueya Premium. Go ahead and claim this special offer through this link to the Hueya website. I hope find these social media tips parents should know helpful. I also hope that Hueya’s exposure score helps you answer the question, “Do you protect your personal information?” in a more objective manner. So how did you score?